Tudor Ulianovschi, Minister of Foreign Affairs and European Integration had today discussion with Dr. Tedros Adhanom Ghebreyesus, WHO Director-General. The elites talked about aspects of bilateral cooperation as well as the most active involvement of the Republic of Moldova in the global health policies initiated by the organization, especially in the context of the implementation of the Agenda 2030 and the Sustainable Development Objectives. 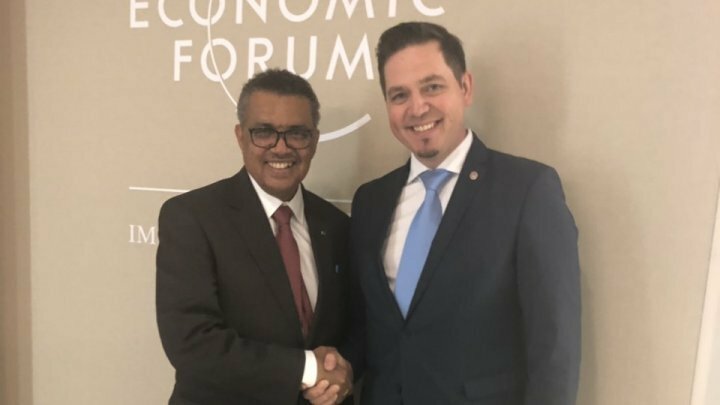 Minister Tudor Ulianovschi and Dr. Tedros Adhanom Ghebreyesus also approached the national health authorities' actions, demonstrating an increased interest in extending the projects implemented with the support of the World Health Organization. Interlocutors also discussed the importance of promoting global health through diplomatic instruments, in which Minister Tudor Ulianovschi reconfirmed Moldovan diplomacy's support and interest in contributing to shaping the global health agenda in multilateral fora both in Geneva and New York.